See the site of one of Russia’s most infamous events on a 3-hour private tour of St. Petersburg's Yusupov Palace. Skip the main entrance lines to explore this 19th-century palace, once home to Felix Yusopov who murdered the mysterious monk and royal advisor, Grigory Rasputin, here in 1916. Admire the original interiors, and see where the grisly deed took place. Private transport, entrance fees, and hotel pickup and drop-off included. 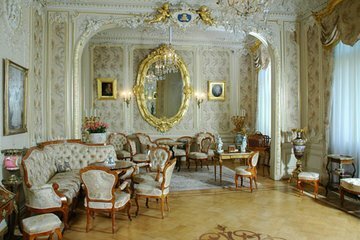 After pickup from your St. Petersburg hotel, travel to the Yusupov Palace, set beside the River Moika. Your itinerary is flexible, so let your guide know if there’s anything you want to see more of, or do, during your tour. On route, hear about the palace’s original owners, the Yusupovs, one of Russia’s wealthiest 18th-century families. The last Yusopov prince, Felix Yusopov, murdered Grigory Rasputin, the distrusted advisor to Russia’s Tsar Nicholas II and his wife, in 1916 — inside the palace itself. On arrival, use your pre-booked ticket to bypass the main lines and head inside with your guide. Ascend to the second floor, and explore the extravagant chambers, left as they were in the 1800s. Admire the Ballroom, Green Drawing Room, and theater; and explore other, ground-floor rooms including the Turkish Study, where Felix played billiards, and the Moorish Drawing Room. Then, see where Rasputin’s murder took place. Hear about the monk’s life, and learn about his gruesome death from the exhibits. Afterward, opt to have lunch or dinner (own expense) at a Russian restaurant recommended by your guide, followed by a hotel drop-off. Alternatively, enjoy a transfer straight back to your hotel, where your tour ends. This was such a fun tour. It is close to St. Petersburg - just a short car ride. The palace was lovely, but the most interesting part to us was the room where Rasputin was murdered. We had to be part of a tour to hear the narrative in English. Well worth it. Tour was good but but we were restricted to only see a portion of the Palace. Very knowledgeable guide. This palace is incredible and the tour unfolds like a novel as you learn the story of the Yuspovs and Rasputin. A memorable experience!